Styled with perle blouse and gabriel pant . 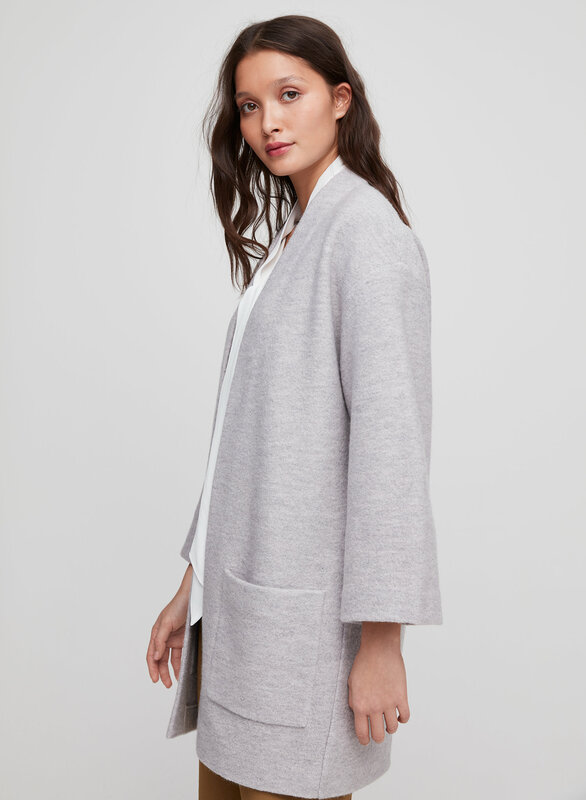 This pared-down cardigan is made with merino wool that's soft yet structural. It mixes a relaxed silhouette with architectural proportions. This sweater is true to the color and size depicted. I’ve worn it several times because I am sick of dark winter colors. However, it pills quite a bit which reveals it’s inexpensive quality. I’ll wear it awhile longer and send it to recycle. Love this sweater so much - its warm and it looks great! You can wear it to work or wear it as a jacket when its cold outside. I highly recommend this! Despite the wide sleeves, this sweater is very warm - perfect for a perpetually-cold person like me. It's a nice cross of comfy and chic. I've received several compliments on it already. And it makes me feel like Ben Kenobi. 5'7" and 115 lbs, I got it in XS. It does look like it will pill a bit. I love the look of this sweater and how timeless it is. The ONLY problem with this, is that it pills SO MUCH. This is common for the fabric it is made of, so it wasn’t that much of a shocker to me, more inconvenient. The only way to keep this looking good is to fabric shave it after each use to remove the pilling. The sweater is cozy, can be dressed up or down and you can pull off a chic look effortlessly!I’ve received so many compliments! 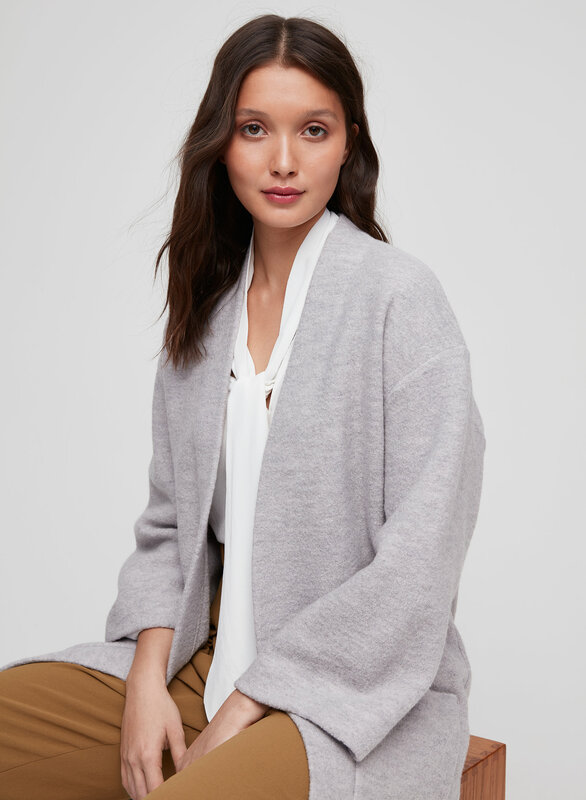 This sweater is super comfortable while also perfect for wearing to work or just hanging around. Love the structured fit and the colour ! Purchases an xsmall. I’m normally a small. Was the right choice. Amazing, warm, traditional and cozy. Love this sweater! Got it on sale after wanting it for a couple years. I got the pink colour, kind of wish I got beige or grey since it's more purple - but I still love it. Great as a sweater or jacket in the spring! I ordered this in the Rose Smoke and I loved EVERYTHING (fit, material, weight, etc) about it except the colour. As the sweater is called rose, I expected it to be so, but it was more of a lavender. As I returned it, I will definitely be re-ordering this sweater in another colour in the near future! 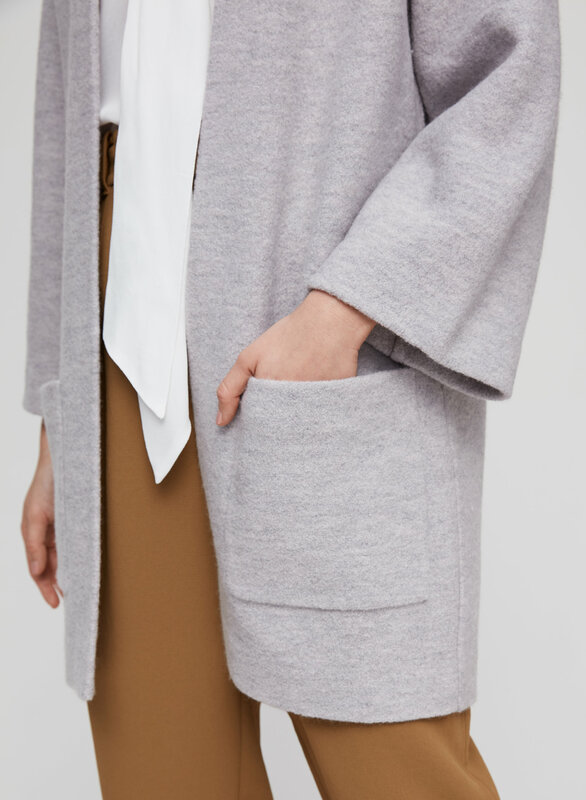 This is possibly my favorite cardigan in my closet -- it looks so beautiful with blouses, thin turtlenecks and dresses. So effortless and completes your outfit! Just bought this in store yesterday and I love it, very high quality. Runs a bit large, I sized down one size. 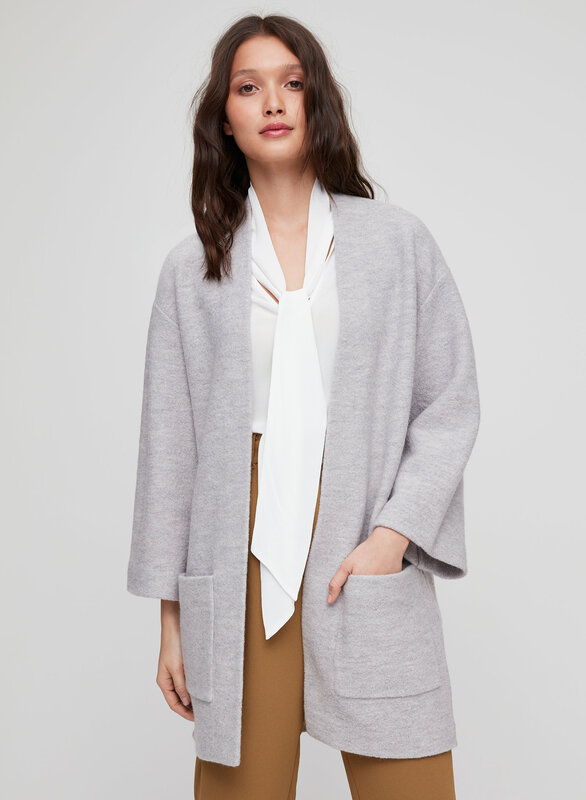 I was looking for a cardigan that goes with everything to stay warm and still look dressed while working from home. 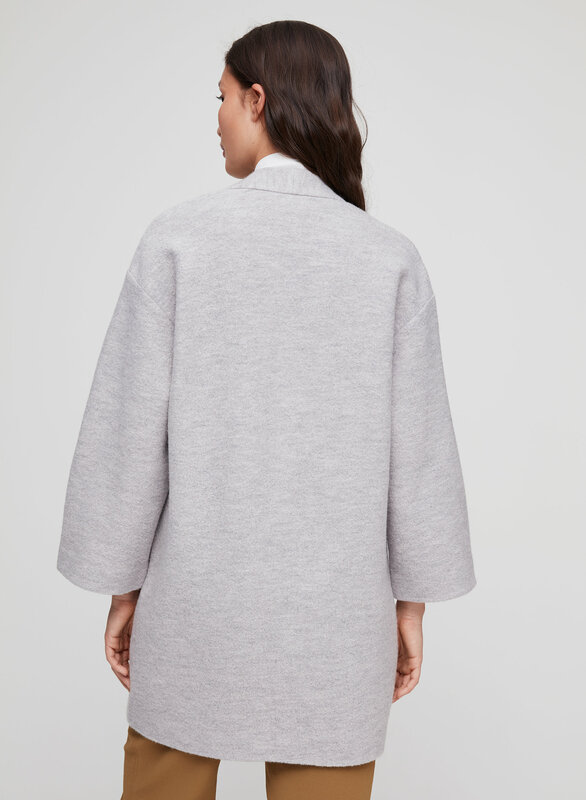 This is the perfect thing that is cozy but still chic. 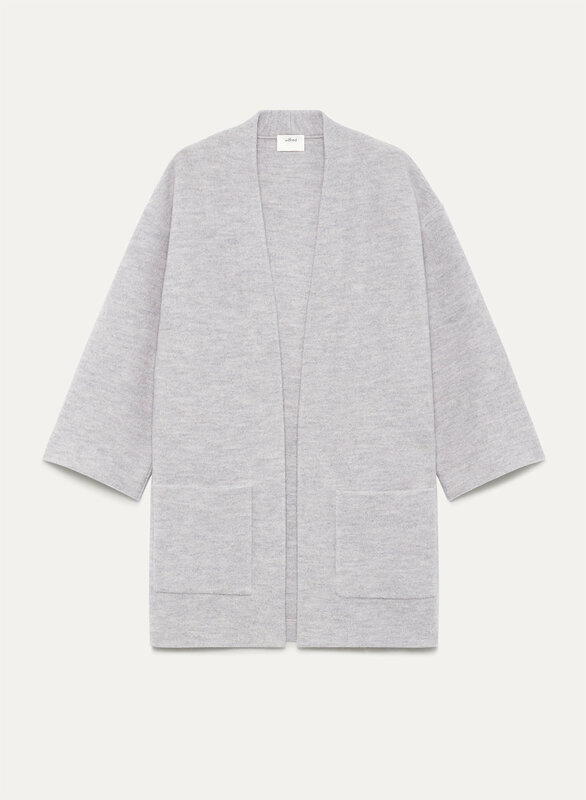 I love the structured boxy kimono cut and will wear it all the time. It's a bit oversized, but that is how I prefer my tops. Great for everyday wear, I would get every colour if I could!! Love, love, love this sweater! I absolutely LOVE this sweater. It's a really nice thick wool material and goes with everything. The fit is a bit oversized so if you want it to be more fitted I would size down. I like the oversized look though. I got it in the bone color and it's gorgeous. Will eventually get the charcoal color because it's such a great piece!